Creativity feeds off creativity, ever seeking new inspiration—ever providing that next spark. Each generation inspires the next to improve—to go beyond. Each advancement in the creation and/or delivery of imagination pushes the boundaries of what can and cannot be. This document is not a selling point. It is a call to arms disguised as a sales pitch. It is an introduction to a revolution that is already underway. A revolution sparked by those who, through the years, have been fearless enough to conquer new ground, and given rise by new technologies that empower the mass dissemination of creativity outside the limits of well-established tradition. daydreams between creator(s) and audience. Formed by writer, Jon Goff (Spawn, Halo Evolutions), as an outlet for creator-owned comic book projects that span the vast range of genres, topics and acceptable behavior, Contraband has but one goal…to entertain (not everyone…but anyone). Showcasing top artistic talent, both established and up-and-coming, Contraband Comics’ initial wave of books features stories co-created and illustrated by Marat Mychaels (Grifter,Deadpool Corps), Travis Sengaus (The Adventures of Spawn) and Jim Hanna (Philly,Spotlight). To that end, Contraband has teamed with iVerse Media, who will be handling the digital distribution of Contraband’s titles, exclusively through their Comics Plus app. Michael Murphey, CEO of iVerse Media, offered, "I've been fans of the guys at Contraband for years now. They're producing exciting, action packed comics that I can't wait to read. We're proud to have them exclusively in Comics Plus." 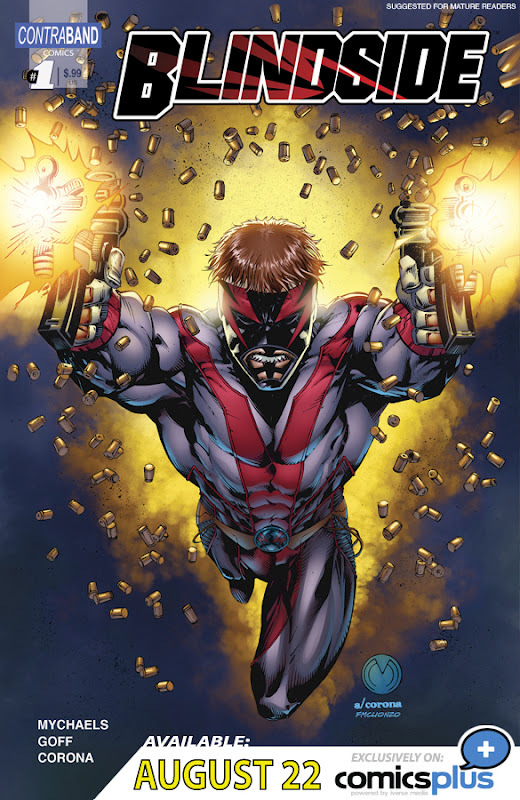 · BLINDSIDE by Marat Mychaels (creator/illustrator) and Jon Goff (writer) – The worlds of superheroics and espionage merge head-on in an all-out, bullet-riddled, adrenaline rush blockbuster! Debuts August 22nd exclusively on Comics Plus. · BIG HITTERS by Travis Sengaus (co-creator/illustrator) and Jon Goff (co-creator/writer) – This science-fiction action/adventure follows the exploits of a pair of sanctioned hitmen – called “Hitters” – as they navigate the seedy underbelly of an advanced post-war universe. 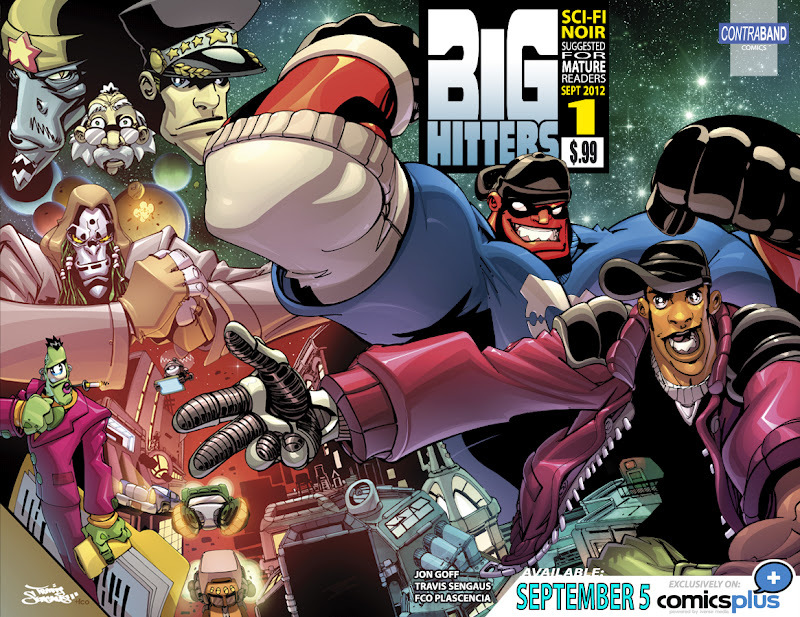 Debuts September 5th exclusively on Comics Plus. 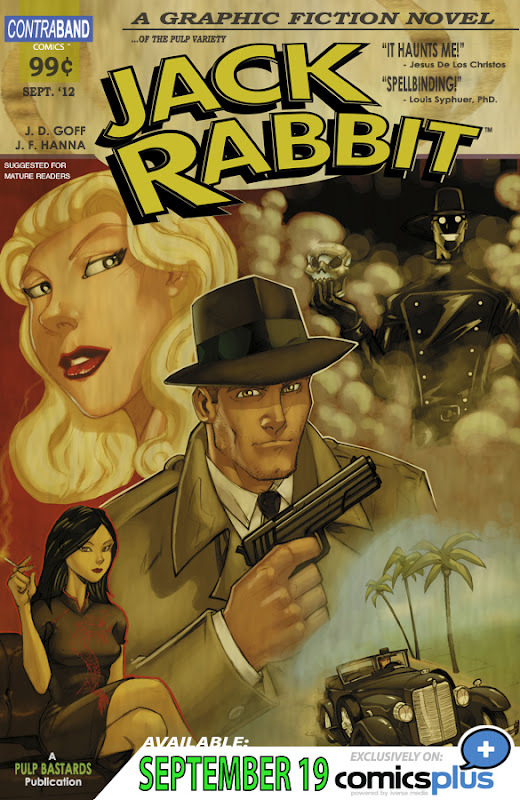 · JACK RABBIT by Jim Hanna (co-creator/illustrator) and Jon Goff (co-creator/writer) – A supernatural crime-noir thriller that follows an ex-boxer-turned-private detective as he investigates the darker corners of 1930’s Los Angeles, where truth and myth merge in a surreal mixture of violence and hope. Debuts September 19th exclusively on Comics Plus.